Story by Delano Lavigne. Photos by Outpost/Ryan Edwardson. The sun hangs heavy on the horizon, sharing the last of its warm rays with me, as I sit staring across the harbour, relishing a spectacular view of the sharply cut cliffs of Nanabijou—the Sleeping Giant. I’ve come to this spot after a relatively short yet arduous day of skiing, and in search of a brief moment of rest and reprieve, before making camp for the night. Among a hoard of buckskinned beaver bait logs, I’ve come to rest—or more like recline—on a perfect specimen of a Canadian pine tree, undoubtedly burnished and rendered barkless by Lake Superior’s restless summer waters. 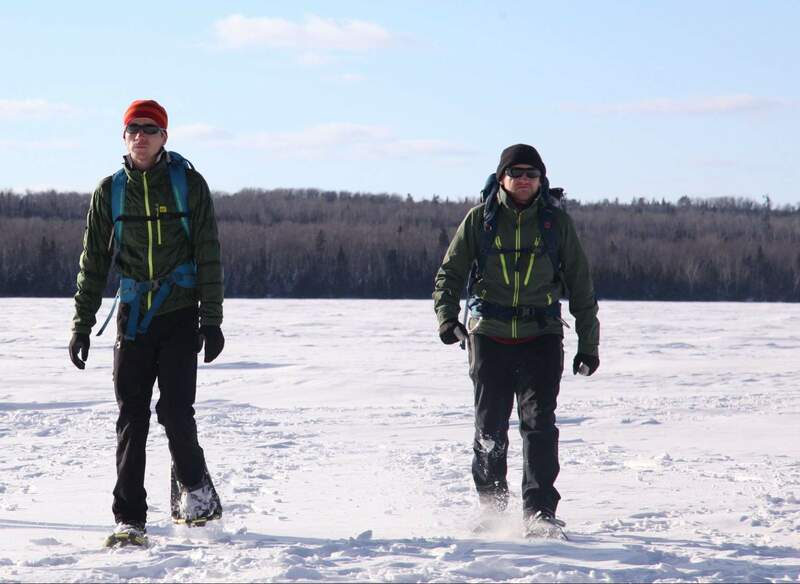 Delano and Ryan snowshoeing in the park. I run my hand across the smooth surface of the tree and can’t help but wonder how long it has lain here, and how long will it rest before being reclaimed by the lake. The logs, along with rounded pebbles of beach gravel and thick ice, all frozen in late winter’s grip, belie the dynamic nature of this northern landscape. And when all becomes quiet, when I have found the necessary stillness within myself, late winter is revealed through the sound of waves slapping at the underbelly of ice that fills the harbour. The ice shifts, cracks and groans echoing like winter whale songs calling for spring, and the illusion of a static landscape is dispelled. Although the land here in northern Ontario has an indelible dynamism, there is also something timeless about this place. As I look across the shore to Nanabijou, I can’t help but feel as though I’m looking at more than a mountain—it feels more like a monument fixed in time. The tapering conical of spires and rounded granite bluffs give shape and life to the Ojibway myth that helps explain the natural phenomena of the region. 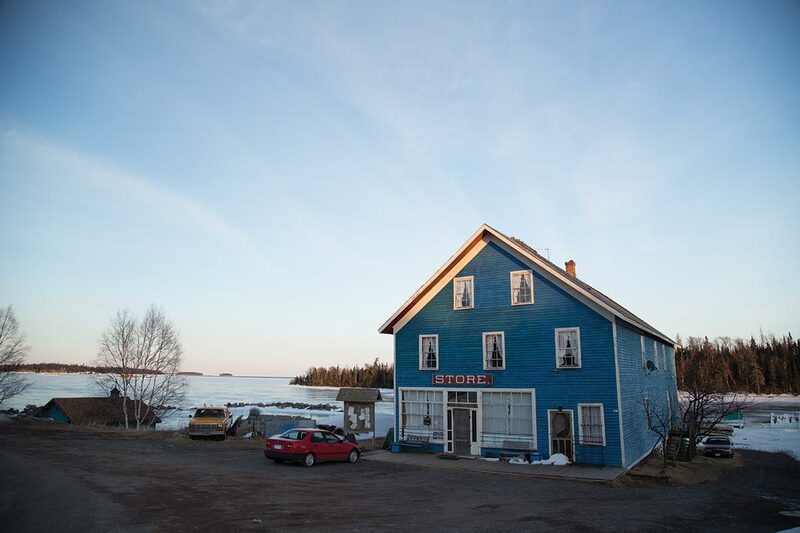 It’s a myth that has played on repeat in my mind ever since I learned of Sleeping Giant Provincial Park and the tiny neighbouring hamlet of Silver Islet. 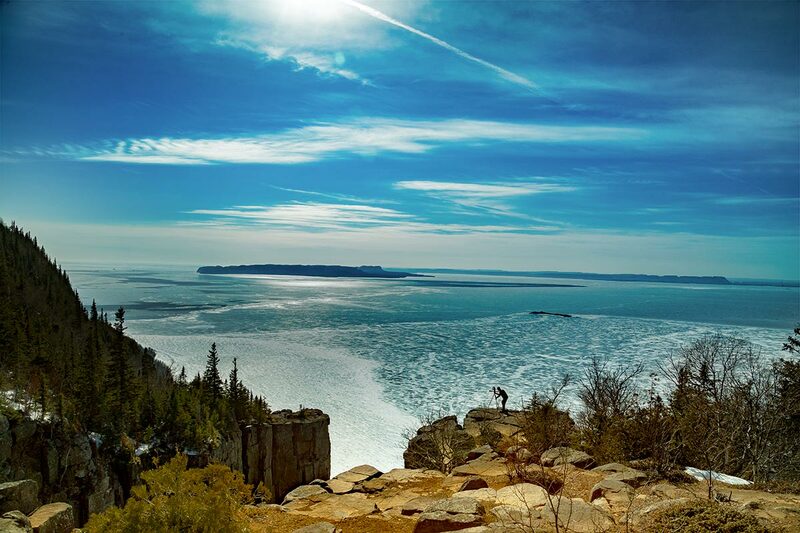 The iconic Sleeping Giant view in March, looking over spectacular Lake Superior. According to legend—or at least the version famously told by Hubert M. Limbrick—Nanabijou, the Spirit of the Deep Sea Water, rewarded the Ojibway natives for their loyalty and peaceful way of living with the secret of a silver-rich mine, now known as Silver Islet. In exchange for this information Nanabijou made the Ojibway promise to keep the secret, and warned that if the mine was revealed to “the white man” that he, the Spirit of the Deep Sea Water, would be turned to stone and that the tribe itself would perish. Soon after, the legend continues, the Ojibway found the mine, and the tribe became widely known for their beautiful silver ornaments and jewellery. Yet the uniqueness of their silver accessories soon became the envy of other tribes and eventually led to the surreptitious discovery of the mine by a member of the neighbouring Sioux nation. During the return journey to his tribe to reveal the secret, the Sioux warrior crossed paths with white fur traders, who, it is said, upon seeing the silver he had taken from the mine “cajoled him with food and drink” for its source. Thus was the sacred promise made to Nanabijou irrevocably broken. When the white traders approached Silver Islet, a vicious storm erupted over the water and the traders drowned before ever reaching the mine; and so the tale ends that where once there was a wide opening to the bay now lies the stone figure of Nanabijou—the Great Sleeping Giant. Despite this hyperbolic account of historical events—this marvelous, fascinating legend—it takes little imagination to see that the mountain does indeed resemble the form of a giant sleeping with its arms folded across its chest. From where I’m sitting, somewhere between the Giant and the silver mine, the story does feel real. And if it wasn’t for the slowly setting sun and the creeping cold, I could continue daydreaming away this late winterish evening. In fact, the sun is warm and the air calm and the sky blue on this crisp, quiet early evening. All of which belie the unseasonably cold temperatures that have settled like a heavy hand over Ontario’s Sibley Peninsula. With temperatures expected to drop overnight to as low as -28 degrees Celsius, I wonder if winter even realizes it’s time to call it a season. I think back to a lecture I heard on climate change more than a decade ago, whereby a visiting professor at my university discussed what was at the time a contested prediction that some regions—like Quebec and Ontario—just might experience global cooling, rather than global warming. I had always wondered if he was right—and from where I am standing now on the shores of Lake Superior, in late March with frost-nipped cheeks and frozen nose hairs, it seems as though he was. The General Store near Sleeping Giant. Yet despite the cold, there is something auspicious and calming about the weather, about a sky that is as deeply blue and settled in temperament as the one that hangs above me. Sure the night is going to be cold—frightfully cold, for that matter. The kind of cold that picks and pokes at you like an older brother testing to see how much you can take before you snap into a raging prepubescent hulk. But I’ve learned that so long as I do my part—ignore the picks and pokes—that tomorrow the sun will rise in a clear sky, and it will quickly and efficiently warm my body and encourage me to continue our journey toward the summit of Nanabijou. The first step of our journey is Tee Harbour, an aptly named capital T-shaped jetty where we have set up camp for the night, and I am currently resting after a hard and heavy ski along the Kabeyun Trail. Although there’s a reasonable amount of snow on the ground and under the trees, which will help us glide as we cross-country ski in this pristine and glorious neck of Ontario, the conditions are not quite what I had hoped for. Early season rain, followed by exceptionally cold late-season temperatures, have led to a thick layer of hard-packed snow, which makes it feel more of a skating rink than ski trail. All this has made for, to say the least, a challenging day of travel, especially with my homemade ski pulk—a sled for gear that straps around your shoulders and you pull along as you ski—pushing, twisting and sometimes pulling me into the thick trees which line the often narrow trail. But I am neither dissuaded, discouraged nor dismayed by the challenges that this late ski season has presented to me. In many ways, this is why I came to Sleeping Giant Provincial Park. 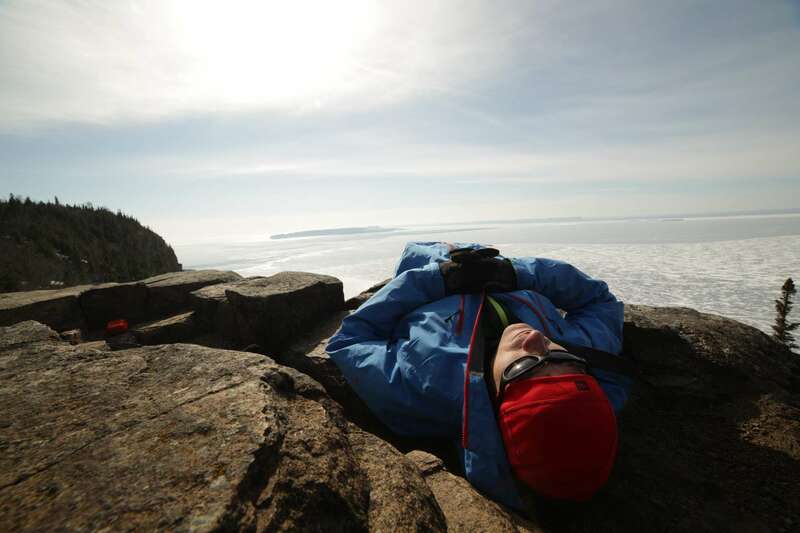 I came to explore a unique landscape and engage with the quiet, remote and distanced trails that run along the Sibley Peninsula and toward the towering cliffs of Nanabijou. My love for skiing and exploring new places overrides any concerns of cold temperatures or bad snow conditions. I came here expecting to be challenged, and I feel invigorated by the freezing cold air and ice-rink snow conditions. So, as the sun begins to dip below the horizon and frozen air fills the harbour, I tighten my arms across my chest, curl my shoulders up, and walk back to camp. I begin to head toward the eastern side of the harbour; but after no more than a few steps I notice a flash of red move across the bright white snow. I take notice of a faint set of yellow-green eyes fixed upon me and stop dead in my tracks, only to see that five metres in front is a beautiful red fox standing resolute, in an almost benign investigation as to who I might be. The fox seems to be, as much as I am, surprised to have crossed paths, and we both stand motionless—the fox paralyzed by instinct and curiosity; I by the quixotic if not childish desire to befriend it, to have it grow comfortable enough to share all its thoughts and feelings with me. I know it sounds odd, but it’s true. The beautiful fox, a new friend. On some level, don’t we all wish we could talk with the animals, or at least become “friends” with them, like some modern-day Dian Fossey? I think it’s because for those of us who unconditionally love nature, who yearn constantly as I do to be in our physical environment, we want to feel in absolute harmony with it. Our contemporary lives have become so busy, so disconnected from the natural world, that whatever opportunity we have to experience it, to actually be in it, we secretly hope reflects our reverence for it. And in this moment, with the stillness of the air and the fox and I crossing paths, I feel an utter oneness with the natural world. After a few more moments of spiritually dancing with the fox I take notice of the sun, now almost completely set, and uninterruptedly make my way to the eastern side of the harbour, where I make an Ojibway-inspired dinner of wild rice stuffed peppers, and lay up for a frigidly cold night in my tent. The night passes slowly. The cold nips and bites at my face through the dark still hours, and although I’ve done all that I can to stay warm I am unable to keep the cold at bay. I’ve pulled my toque down as far as I can over my face, wrapped an extra layer around my neck as a scarf, changed into my wool base layers, filled my water bottle with warm water and cinched my mummy bag so tight around my face that only my nose and upper lip are exposed to the air. Winter camping does not get any better: in the tent, checking out the map for the next day’s trek. But alas the cold — unbiased and unsympathetic to my circumstances — sneaks into my sleeping bag, stinging me awake with even the slightest of movements. The night dribbles on as if time itself has been stalled by the cold temperatures. I feel frozen in a haze of half lucid and half delirious sleep, as if inebriated by the cold. As expected, the sun eventually makes its way to the horizon and my spirit begins to lift with the ever brightening sky. 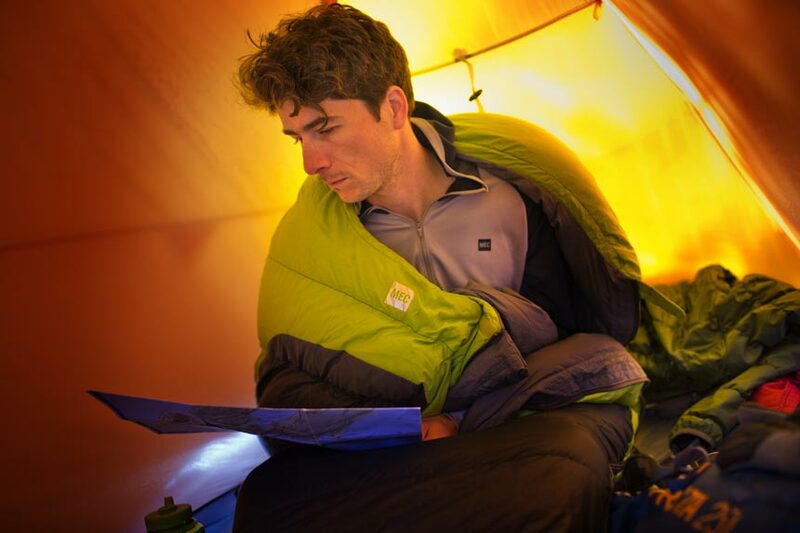 I unfurl from my sleeping bag, rush to make a warm brew of tea and thaw my skinny little bones in the morning sun. The sun shines a bright and intense light across the harbour, revealing another cloudless day. The intense experience of the cold night, which loosely translates into “suffer fest,” melts away with the warm air, and my spirit is lifted even more as the weather promises a storm-free day. I am now free again to focus my energies on Nanabijou, so that when my cup of tea becomes cold I quickly turn my attention toward the summit. Breakfasting in the bitter cold, but sunny and spectacular day. The trail to the summit is as similarly iced over as the one that brought me to Tee Harbour, albeit with a significantly more dramatic rise in elevation. While the Kabeyun Trail between the park entrance and Tee Harbour is relatively flat, the Talus Lake Trail which connects to the Top of the Giant Trail, climbs from near the water’s edge to the summit of the Giant itself. It’s not a terrifically long trail, but it certainly is steep. Thankfully, the steep slopes of the switchback trail are almost fully exposed to the east and, in turn, the morning sun’s warmth. By the time I reach the eastern slope of the mountain the ice and snow have softened, making the greatest challenge of the day post-holing through what is at times waist-deep snow. But with a bright and stunningly spectacular sky, and a sun warm and sweet enough to make me believe that spring is finally springing, I am happy to wade through the deep snow and up the steep, invigorating trail. My gaze is placed squarely on the summit, and I am resolute that only a white-out and ferocious storm can turn me back. A few hours after having left camp, I finally connect to the Top of the Giant Trail. The trail runs along the eastern rim of the summit, zigzagging its way along cliff edges and through beautiful groves of maple and spruce trees. The stand of maple trees is a wonderful sight, and reminds me of the forest I grew up playing in. There is something about a maple forest that feels like home, and coming across this one on top of such an incredible mountain is deeply uplifting. 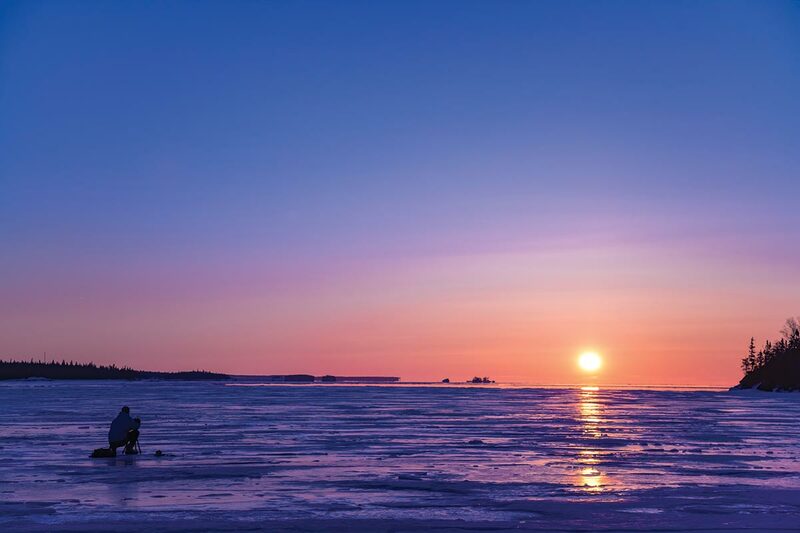 Capturing the jaw-dropping northern Ontario sunset. I expected a quasi-barren landscape of rock escarpments separating Nanabijou’s head, chest and knees. But what I have found is a beautiful forest; healthy and alive, giving me energy to finish my hike to the summit. So I push on, despite the sun softening the snow to the point where it becomes easier to walk on my hands and knees than punch through the snow with my feet. After another hour of warm and wet hiking, the snow gives way to rock. I’ve finally made it to the southwestern slope of the summit, effectively Nanabijou’s knees. Here the sun is strong enough to have melted the ice and snow and to reveal a view more spectacular than I could have expected. The still-frozen water of Lake Superior stretches for miles and miles, and the broken and refrozen leads in the ice are like an abstract painting. The ice is dusted white, but from high above I can see varying shades of blue, silver and what seems like green shadows of deep water. Large and small islands dot the horizon, and 100-metre cliffs fortify the flanks of the mountain. In search of the view. It is quite the sight to behold. So I do exactly that; I hold it. I find a warm nook among the rocks and soak it all in. And then, only somewhat to my surprise, I see yet another fox standing in the forest, way across a wide cleft of rocks. I whisper a silent “thank you” — not to anyone or anything in particular, but to the moment itself. I am grateful to have found this moment in time, high above one of Canada’s greatest lakes, and remain in motionless reverence for the mysterious, alluring animal that seems so at ease and so regal on such a formidable landscape. I’m also thankful for the character, so to speak, of this mini-expedition with Team Outpost in search of the view. When I adventure into the wilderness I only ever hope for an authentic, genuine experience. Authenticity is my standard and my goal, and to have experienced it so fully in Sleeping Giant Provincial Park is something to be grateful for. Founded in 1944 as Sibley Provincial Park, Sleeping Giant Provincial Park was renamed in 1988 to honour regional aboriginal heritage. Located a one-hour drive east of Thunder Bay, in northwestern Ontario near the communities of Pass Lake and Dorion, the 244-square-kilometre (94 square miles) Sleeping Giant Provincial Park can be reached via highways 11/17 and 587. 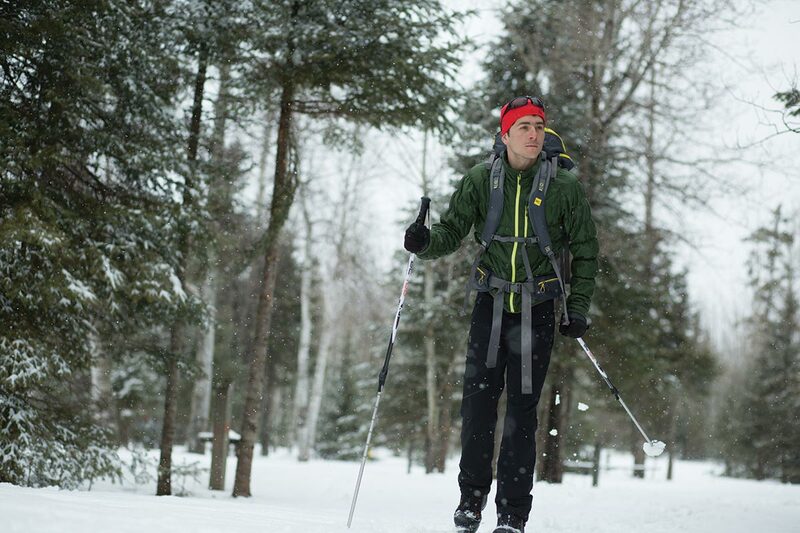 The park is open year-round, with more than 100 km of hiking trails that range from loops under one km to the 40-km-long Kabeyun Trail and 50 km of groomed ski trails during the winter. The park also offers cycling, boating, canoeing, kayaking, fishing and snowshoeing. The park has 200 campsites at Marie Louise Lake Campground, with almost half providing electrical service. There are also group campsites that can accommodate up to 50 people, as well as approximately 40 backcountry campsites that cannot be reserved in advance and require backcountry camping permits. The campsites are open from May until October. The Ranger Lodge provides accommodation and facilities for groups of up to 30 people, while winterized cottages and trailer-equipped campsites are also available. 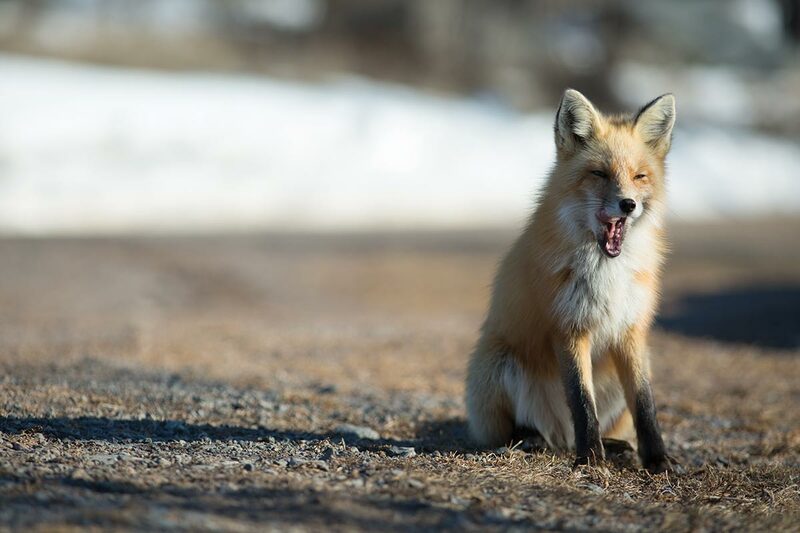 The park is home to more than 200 species of birds, 23 species of orchids (including two of Ontario’s most rare) and many animals including moose, wolf, black bear, white-tailed deer, lynx and of course, red fox. The top of the Sleeping Giant can be reached via the Top of the Giant Trail, which branches off from the Kabeyun and Talus Lake trails, for a round-trip trek of approximately 22 kilometres from the Kabeyun trailhead. 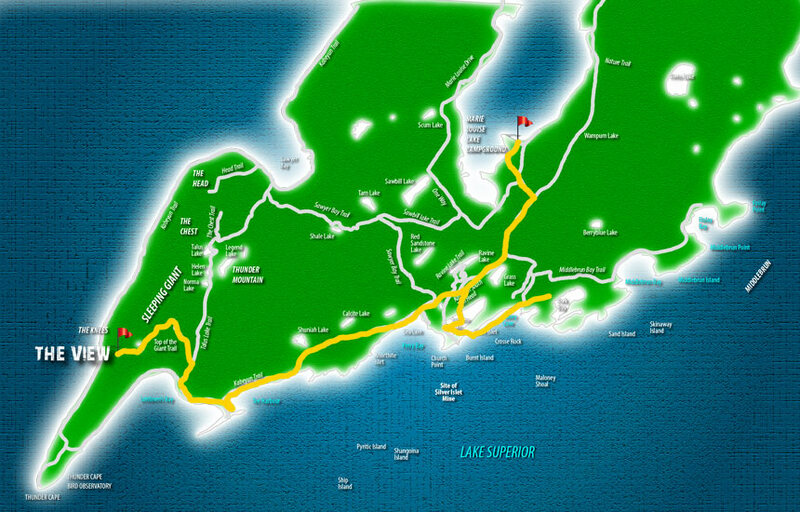 Alternatively, the Thunder Bay Lookout Road provides vehicle or mountain bike access to the Thunder Bay Lookout, which offers spectacular views of Lake Superior and its stunning boreal forest. For more info on how you can explore Sleeping Giant Provincial Park, check out the Ontario Parks website. 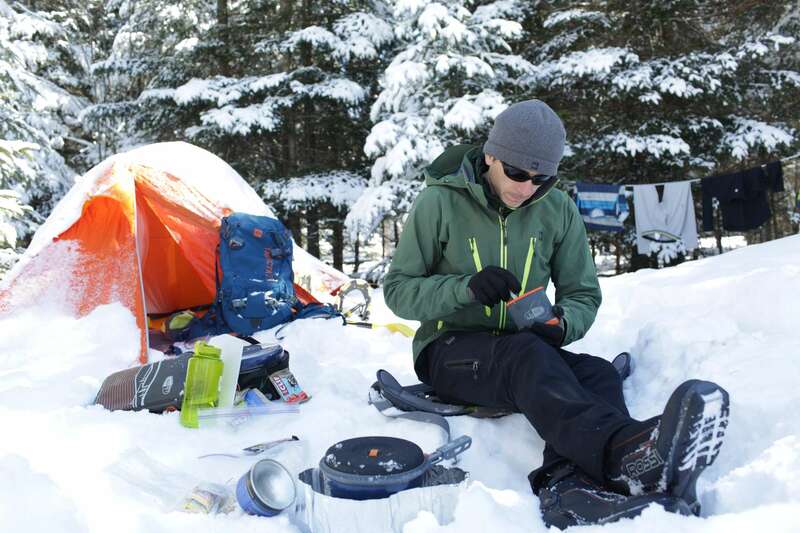 Delano Lavigne is an expeditioner, climber and in-field gastronomic guru, who’s led a number of opXpeditions for Outpost, including to Switzerland, Dominica, Canmore and Wood Buffalo National Park. Wow the pictures are incredible, specially the sunset. Reading this article made me feel that I am also in that place. Thank you for sharing your experience.